It would seem that we’re headed into an area that the rule of law does not cover… namely that of individual states going bankrupt. It’s not happened before, the Constitution does not address it, nor does any other set of laws. So, will the Fed step in and bail the states out? Of course they will, they already are, just not enough to save them yet. The real question, of course, is who bails out our nation? Any way you slice it, ultimately it’s going to be you and I, and I’m going to have a lot to say on that subject, because my preferred way of doing so will not look anything like the central bankers have planned, that’s for sure. Michigan and California are likely to face a fresh round of budget woes when federal stimulus funds used as a fiscal crutch dry up, finance directors for the states said Friday. "We're facing a cliff in 2011 when stimulus dollars run out," said Mitchell Bean, director of the Michigan House Fiscal Agency. "There is not an end in sight, even in recovery." As of July 2009, California's budget shortfall was 49.3% of its general funds. States have considered drastic options to fill such gaps. "I looked as hard as I could at how states could declare bankruptcy," said Michael Genest, director of the California Department of Finance who is stepping down at the end of the year. "I literally looked at the federal constitution to see if there was a way for states to return to territory status." Mr. Genest estimated that, eventually, 40% of the state's budget would go to the state Medicaid program, 40% to education, 10% to debt service and 6% to retiree medical services and pension—leaving little left for anything else, such as the state's corrections system. Mr. Bean described a similarly depressing scenario for Michigan, which could end the recession with 25% fewer jobs than in June 2000 and a total of one million job losses. Michigan's unemployment rate in September was 15.3%. He suggested that strict term limits often lead to political gridlock that prevents large-scale changes, such as overhauling the tax code so it is broad-based with lower tax rates. Mr. Bean said lawmakers will likely have to trim the budget at least 12.5% this year after closing a $2.8 billion gap last year. "Citizens don't quite understand yet the implications of some of the cuts that we've made," Mr. Bean said. "A lot of it has fallen on local governments. I am very concerned that we're going to have a lot of insolvencies in local governments." As usual, tons of real problems with no real answers to be found. That’s because real answers don’t exist in the boxes presented to you. Watch “The Secret of Oz” and get ready for some real answers to flow your way. Michael Greenberger, a University of Maryland law professor and veteran federal regulator, studied the House committee's 187-page bill and detected the fine needlework of Wall Street lawyers. "It had to be written by someone inside the banks," Greenberger said, "because buried every few pages is a tricky and devilish 'exception.' It would greatly surprise me if these poison pills originated from anyone on Capitol Hill or the Treasury." A well-informed Congressional source confirmed that the original language in the draft legislation was written by financial-industry experts. It "was probably written by JPMorgan and Goldman Sachs," he told me, "and possibly the Chicago Mercantile Exchange." There you have it, how laws are really written in America. Any law written in a competent manner, such as Ron Paul's Audit the Fed bill wind up so gutted that they become completely meaningless, or worse, even more dangerous, like the bank "stress tests" that are designed to enhance perception only and leave the sheep with a false sense of security. There is obviously a better path forward for America, we need to get to work. Last Monday was the best fit for a Phi Mate and Bradley Model Turn date. No turn has happened as yet, the market is simply quanting and computing its way forward, looking set to retest recent highs. This is occurring despite divergences of historic proportions, valuations of historic disproportions, massive insider selling, and a consumer whose level of confidence in the economy is more truthful than government statistics which simply do not match statistics that are not subject to manipulation… things like tax receipts which are down jaw dropping amounts. The more they spend, it seems, the less they get back. That’s what happens to crazy people who don’t understand nature or math. Still, it seems pertinent to ask if turn dates have stopped working? Do the mathematical relationships of nature no longer have meaning? In fact, the majority of trading now occurrs on the back of just a few of the big players computers, they feed on dollar carry and interest arbitrage to get their fuel, and remain unbridled by any sense of adult supervision. That fuel, however, will not last forever, nature will reassert herself, just as she always takes care of excess. The turn will come, patience is a virtue afterall, and we are all being taught lessons in that regard. Nature can be seen in the markets, I see it at work all the time… retracements that turn right on Fibonacci levels, pivot points that act as support and resistance, their underlying math related also to Fibonacci. For the uninitiated, Fibonacci numbers are those that are the sum of the previous two numbers in the sequence. Thus we have numbers that go 1, 1, 2, 3, 5, 8, 13, 21, 34, 55, 89, 144, 233, 377, 610, 987, 1597, 2584, 4181, 6765, and so on. While that sequence may not look important on the surface, this underlying math structure is the building block of nature. It affects the number of appendages on your body, the number of pedals on a flower, and it also can be found as the basis of wave structure. 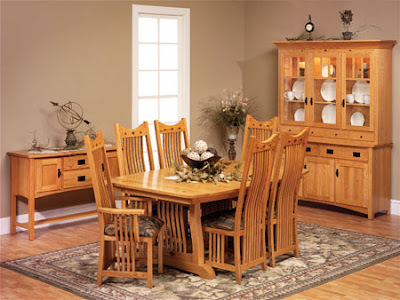 It is used in architecture, in design, and in marketing. It is everywhere. For those with more interest, you can find more math based upon this sequence here: Fibonacci Numbers. Interesting things happen when you look at Fibonacci in terms of time. 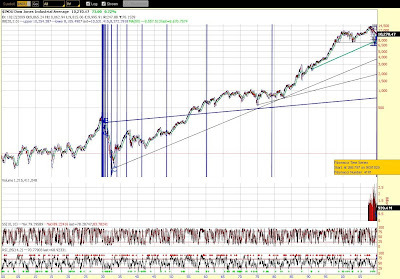 It is very common to find major market turns that are in Fibonacci relationships to major turning points of the past. Sometimes one relationship from one major turning point will happen on top of another. 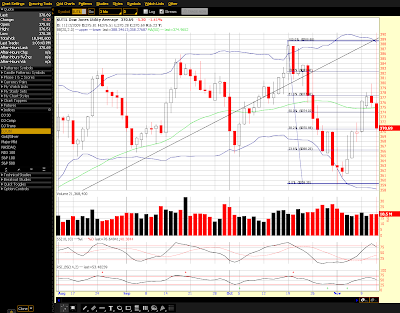 These points are the basis for Fibonacci turn dates. They can be counted in seconds, hours, days, weeks, months, or even years… These obviously do not always work, but they do have better odds of producing a turn than simply guessing. They do not tell direction or magnitude, only that whatever direction was in place is more likely to reverse. 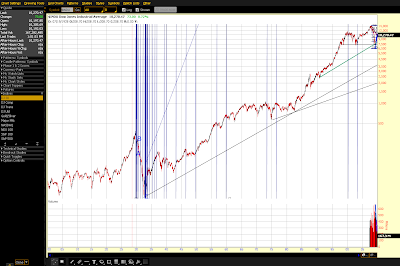 Let’s start by looking at Fibonacci time relationships on the DAILY timescale… Below is a chart showing the S&P 500 with a Fibonacci daily time sequence that begins on the 1929 peak. Take a look at how day number 17,711 nailed the very peak of the market in the year 2000, and it wasn’t that far off many other turn points as well. 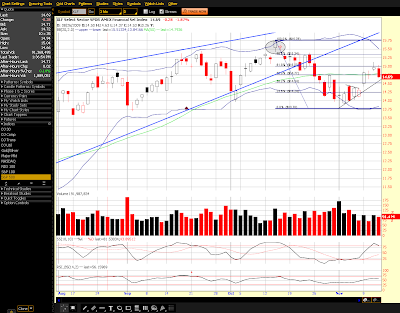 Next is a daily sequence of the DOW off the 1932 bottom. 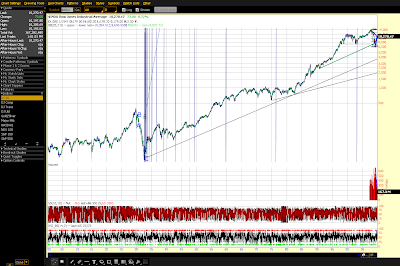 Note how it landed right in the 2002 low… that same thing happens on the SPX chart as well on this timeframe. Note that the further out in time you go, the longer the time interval. That’s the Fibonacci function at work, always adding the last two numbers upon one another. Now, this is why I am doing this piece to begin with. When you drop a WEEKLY sequence off of the 1929 high, it lands on NOW, as in THIS WEEK, the 4,181st week since the peak in 1929. Now, you will note that this weekly sequence does not seem to land on the major turning points, so it may have little to no meaning, I don’t know, it’s just interesting, and we’re about to find out as there is no doubting that the trend into this sequence is up. 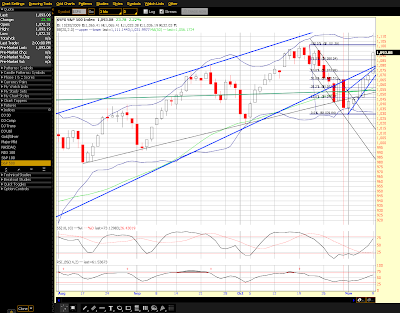 Here is the same chart of the SPX WEEKLY showing that week 4,181 just came into view. 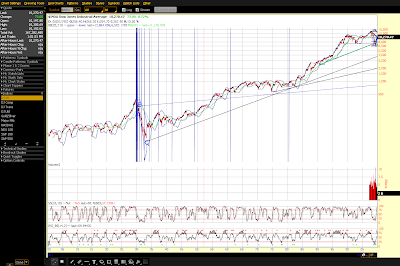 Interestingly, on the MONTHLY time frame, we are approximately two more years away from the next sequence which will land in the year 2012 from the 1929 top, and in the year 2014 from the 1932 bottom. Again, this is just fun with charts, something interesting to look at, nothing to get excited about for sure. 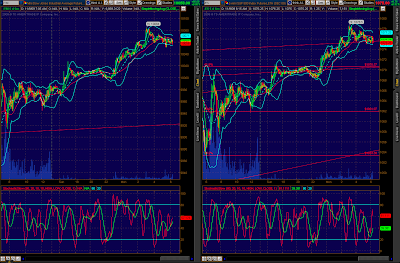 Still, interesting that the weekly timeframe aligns closely with the recent Bradley and Phi Mate turn dates. 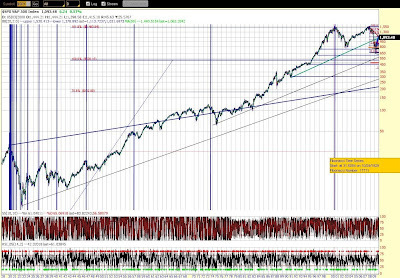 I do believe we are very near a major top, but that belief comes from other areas of technical analysis. The primary count now in Elliott Wave analysis allows for one more wave higher. The fuel has not yet been removed from the criminals distributing their positions to the masses, a good reason for patience, no need to get ahead of the next move, it should take quite some time to play out. The dollar is up, bonds are down, oil and gold are both down significantly. Demand for purchase applications plunged in the Nov. 6 week pointing to the risk of a dip backward in home sales. The Mortgage Bankers Association's purchase index fell 11.6 percent in the week to a nine-year low (MBA did not release index levels, only percentage changes). In contrast, the refinance index surged 11.3 percent in the week. The proportion of refinancing applications to purchase applications is 71.5 percent, the highest since May. Mortgage rates are at rock bottom with 30-year fixed averaging 4.90 percent, down 7 basis points in the week. Refinancings will give a big lift to homeowners, cutting down monthly costs and allowing the hardest pressed to stay in their homes. But the indication on home sales is a disappointment. Next data on the housing sector will be housing market index on Tuesday. 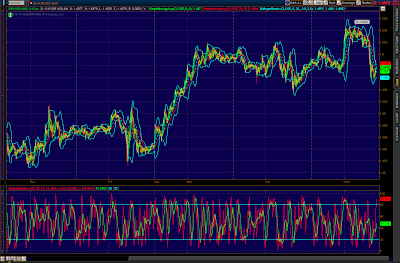 All I can say is wait until rates move higher. They will. No impact? The market has already priced in zero unemployment for cripes sake! We need to create 150,000 jobs a month just to keep up with population growth and we’ve been losing massive jobs for months and months. There are people that have been unemployed for so long that they simply run out of benefits and are no longer counted here. Thus the government does everything they can to make the data and themselves look as good as possible. This is the same reason MBA no longer reports real index values, they simply do not want you to see the truth. Little Timmy Geithner was flapping his lips yet again about how important our strong dollar policy is! Talk about a joke of a “man.” He’s a little boy who can’t say no to his pals. In fact, I can’t really point to an adult in the entire administration, it reminds me of a teenage binge. But, the dollar is higher overnight getting back above the 75 support level, and the EUR/USD is falling back from its run above 1.50. 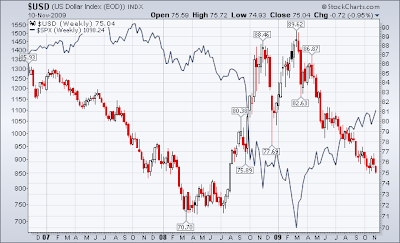 To say that the market is overbought is literally the understatement of the year. Divergences abound, and now 100% of stocks in the DOW are over their 5 day moving average. Yesterday’s low volume ramp up set a new high in the S&P and changed the Elliott Wave count there to still being in wave B up, this would be the final wave higher. 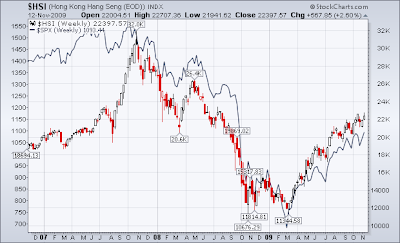 According to Tony Caldero, all the major overseas indices are in confirmed downtrends, meaning that their wave B’s have been completed and that the wave count has now eliminated those indices from being in an uptrend. 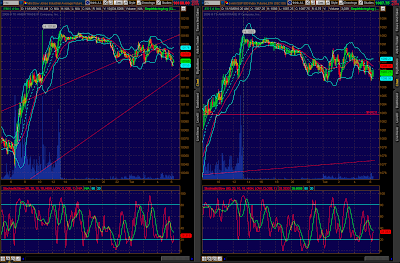 Thus the markets are in a complex state with divergences all over the place. I think this is screaming TOP at us… it is near, but blow off tops can run irrationally, especially with all the teenagers running our country and our markets. Want to see a snapshot into the REAL economy? 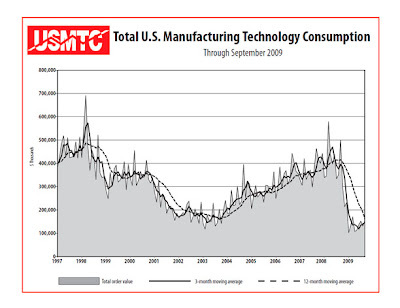 Here’s a chart from the Association for Manufacturing Technology (AMT) and The American Machine Tool Distributors’ Association (AMTDA) showing machine and machine tool consumption. 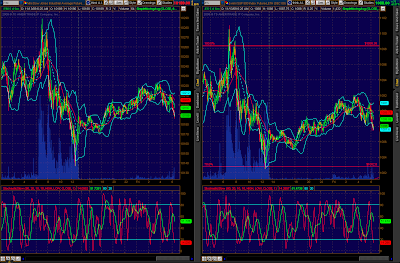 Look at the current levels compared to the bubble days. Looks like less than 25% of the peak value. 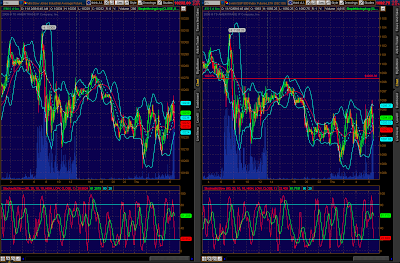 And how about that bounce upwards at the end, looks just like the stock market, no? Anybody remember the line, “Subprime is contained?” And the same people who made statements like that are still running our country and lying to us. Hey, the candles from yesterday could represent a top, Monday was a turn date and the turn has yet to happen, it should happen this week. 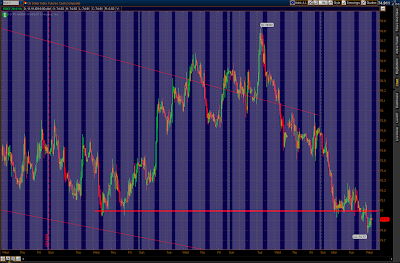 1,090 is support, if it falls, 1,061 is next. This article is very timely. 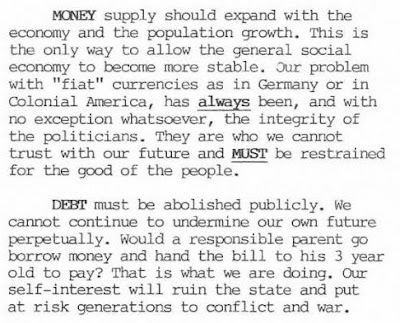 It dovetails perfectly into what I have been saying about debt based, fractional reserve, fiat money systems and also about the beliefs in gold backed money systems. Again, I used to spout the line, “no fiat system has ever stood the test of time!” But the truth, as Martin aptly points out here, is that the gold standard has NOT stood the test of time either! That doesn’t mean that gold is not a hedge against a LOSS OF CONFIDENCE, it is. 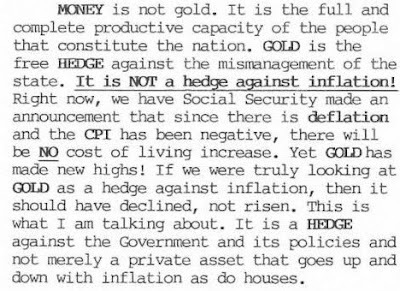 What it is NOT is a hedge against inflation, again, as Martin points out. This is one of his best articles ever. What he says here is extremely important. He is saying that the gold standard is not the answer, that both systems fail because politicians (and bankers) cannot be trusted! Thus, we circle back to what Bill Still is saying, “It’s not WHAT backs the money, it’s WHO controls its QUANTITY!” I encourage everyone reading this to view Bill Still’s movie “The Secret of Oz.” Once you have seen the movie, please join our discussion, I will be doing several articles on it. I agree with Martin that the gold backers will hate this language, but it is true. You must judge history for what it is, not what you hope it was. There is a better way forward, and I’m going to present that path to you in the days ahead. All this does not mean that I don’t own gold, I do! Martin goes through key levels of support and resistance and lines them up with his turn points to give you a better feel for the market. A terrific read, I hope you enjoy it and please take what he’s saying here to heart. I would first like to point out that the IMF, the world bankers, this weekend talked down the dollar while the G20, many of whom are the same central bankers, talked up the strong dollar policy. Meanwhile they reiterate their never ending stimulus ways. Is it any wonder that the dollar is sinking? To those who say that ½ or even 1% currency moves in a day are no big deal, I will simply remind them to look at the dollar action prior to the crash of 1987. 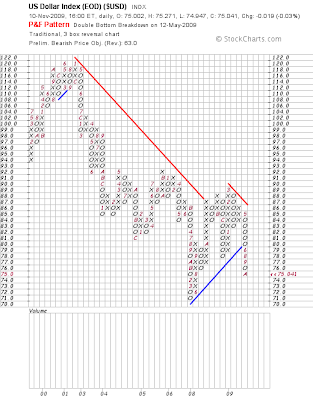 We have an interesting situation between the Industrials and the Transports in that the Transports had made a new low, but the Industrials had not. 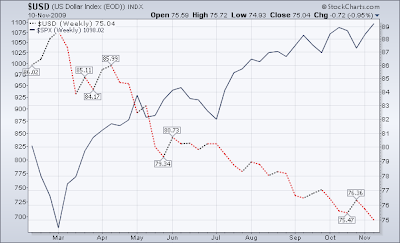 Now the Industrials have made a new high, but the Transports have not. 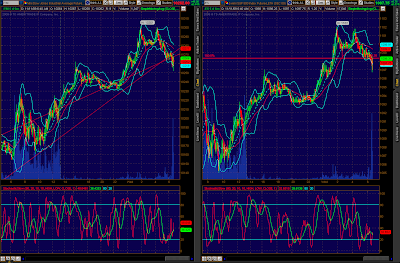 That’s a potential Dow Theory non-confirmation set up once again, something I will be watching. 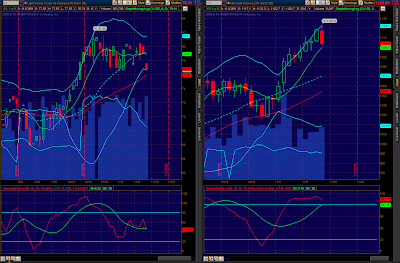 The NDX and the XLF both left sizable gaps below today’s candles. Those gaps will be filled sooner or later. 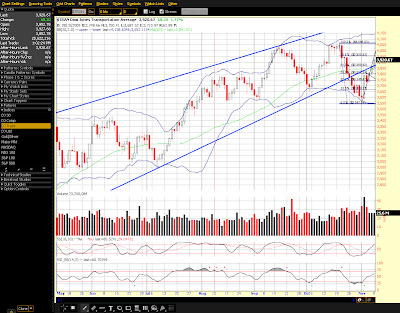 On the DOW Industrials, the new high eliminates the possibility that wave C down has begun in that index. Thus, Elliot Wave rules tell me that I was wrong to believe we had made wave 1 down and are now making wave 2 up, at least in the Industrials. That’s all I need to know to go back to sitting on my hands and waiting patiently. I guarantee you that I have more patience than Goldman has quant computers. 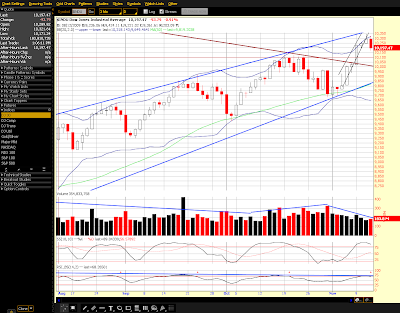 No need for panic on the part of the bears, the fundamentals are well on your side as are the technicals. 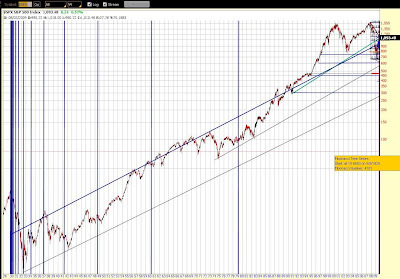 Now, many are going to decry the technicals as no longer working. To which I say again, patience. This reminds me of the signs of a bubble; the wise market observers trust the historical references and are gone. It is the new money that remains, and eventually they will all be caught at the exits at the same time. Patience, all the divergences WILL RESOLVE, the further out they are, the more likely the real correction will be swift and very painful. 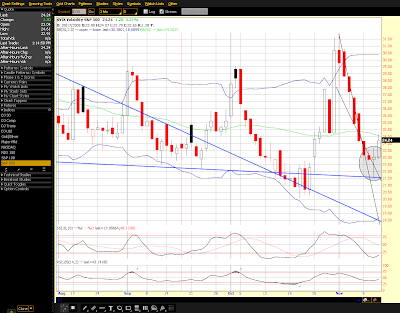 Oh, and one more development is a sell signal on the weekly MACD indicators as pointed out by McHugh. 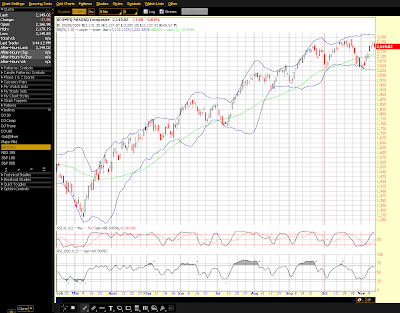 The MADC rose into the same extreme overbought region as the 2007 top and has produced a sell signal despite a rising market, the same divergence produced then. Yeah, it’s a big bad scary market, if you’re in it. I still say that being in is nuts, let the criminals have their fun, history has a way of catching up to them, and averages are averages because as much time and deviation is spent below the line as is spent above… no one, not even the inventors of derivatives, can create valuations that go on forever, any more than someone has invented a machine with perpetual motion.